It has recently been reported that a Roman ring, suggested by some to have inspired Tolkien when he was writing The Hobbit, has been put on display at The Vyne, a Tudor house in Hampshire, in association with the Tolkien Society. I have some reservations about this story, both from the perspective of a writer and as the holder of a degree in Ancient History and Archaeology. The media reporting this story, as well as the people at the Vyne and in the Tolkien Society, display a lack of understanding of how inspiration works for a writer. In fairness, I can’t speak for other writers, but I find inspiration is never about one thing. Inspiration comes from a thousand sources, and the way I link my experiences to one another. My story Ailith’s Gift wasn’t inspired by one thing, but by many – my studies of Roman Wroxeter; the way certain fictional characters turn into dragons at the end of their stories and my fiancé’s reaction to this trope; the shape of the Wrekin, visible from so many places near here I live; what I’ve read of magic; what I’ve read of the spread of Christianity in the previously pagan Britain in the Anglo-Saxon period; my favourite flowers; local history. There are probably a dozen other things, at least, which in some manner paved the way to my writing that story in the precise way I did. So yes, the ring might have had some impact on Tolkien when Sir Mortimer Wheeler consulted him on the curse tablet with which it has been linked, because inspiration comes from so many different sources. But I think its impact has been exaggerated here, probably by the exhibit’s organisers to attract media attention and capitalise on the interest in Tolkien at the moment because of the Hobbit movies. In the Hobbit, the first time Bilbo comes across what later emerges is the One Ring, it is described as “a tiny ring of cold metal”. Nothing more. No embellishments, nothing special about it; it’s not even mentioned what kind of metal it is. 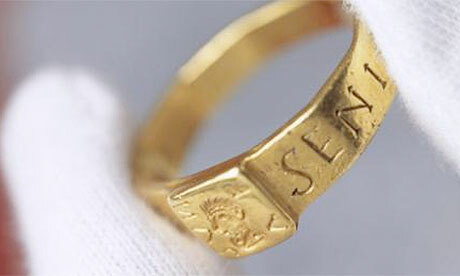 Meanwhile, the Roman ring is described in the New York Daily News as “so big that it could only fit around a gloved thumb”, and features an inscription and the image of the Roman goddess Venus. The thing is, this ring can’t have been the only one Tolkien saw. Given that he was the Professor of Anglo-Saxon at Oxford University, it probably wasn’t the only archaeologically excavated ring he’d seen. The Anglo-Saxons made plenty of gold jewellery. It isn’t even clear from the various articles online about the ring that he paid much attention to it – or even saw it at all – as Sir Mortimer Wheeler was asking him about the associated curse tablet, where a deity called Nodens is mentioned, not the ring. So the link is, at best, tenuous; articles calling it “The Roman Ring That Inspired Tolkien’s Middle Earth” are therefore misleading. Especially since it is the period of Tolkien’s own expertise, the Anglo-Saxons, that comes through most clearly in Middle Earth, and not the Roman period. Indeed, Middle Earth is a rich and varied world, far more than a ring alone could have inspired. It is, to my mind, like learning that at the age of 13 JK Rowling saw a magic show in which a magician seemed to make a feather levitate, and saying that this inspired the world and stories of Harry Potter. It’s patently ridiculous. What this also does is distract and detract from the ring’s archaeological value, and that of the curse tablet. They are mentioned in a comprehensive collection looking at curse tablets, John Gager’s Curse Tablets and Binding Spells from the Ancient World, number 99. They can reveal a lot about religion in late 4th century CE Britain, a time of political and economic instability when Christianity was taking hold in the Roman empire and anti-pagan laws were being made to ensure Christianity’s spread. The ring is incredibly valuable just because of the amount of gold it contains, but is hugely important as an archaeological artefact because of its Christian inscription, the depiction of Venus on it, and its association with the curse tablet, which is roughly contemporary and was found only 50km away from where the ring was found (not 100 miles as the New York Daily News article claims). Much of the last two paragraphs weren’t mentioned in some of the articles written about the ring going on display. They focused on Tolkien, and most mentioned Sir Mortimer Wheeler, the dashing archaeologist of the early 20th century who presented some of TV’s earliest programmes on archaeology. In other words, to the media, the ring’s importance was in how it linked to people a modern audience have probably heard of. Its archaeological and intrinsic value were overlooked. And that’s a sad thing, because archaeology is interesting, it reveals the roots of our modern society, where we’ve come from and why we are the way we are. It’s also a brilliant source of information and inspiration for some of those who would be most interested in the media frenzy over Tolkien and the Roman ring: fantasy writers. Having said all that I can understand where the exhibition organisers might be coming from. Archaeology is not mainstream. It’s academic and middle class, as a general rule. It’s not seen by a lot of people as cool. So at a time when there is all this interest in Tolkien because of the Hobbit movies, they have this opportunity to gain interest through a means not normally available to them, and get people interested in what they’ve got, and possibly subsequently in less star-studded archaeology. But the truth is, the link to Tolkien is minimal and the claim that this particular Roman ring was the inspiration for the One Ring is, at best, a stretch.